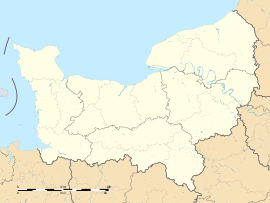 Val-de-Vie is a commune in the department of Calvados, northwestern France. The municipality was established on 1 January 2016 by merger of the former communes of Sainte-Foy-de-Montgommery, La Brévière, La Chapelle-Haute-Grue and Saint-Germain-de-Montgommery. Wikimedia Commons has media related to Val-de-Vie.